We are agree with them! they are pioneer of eCommerce plugins. Because of that, Publisher is fully integrated with WooCommerce and added its page templates as built-in templates. WooCommerce has its own documentation and support forum so we don’t do their job and say what they have said already, just want to answer some common Publisher users questions about WooCommerce. WooCommerce is contained in Publisher package but it is free plugin and you can download it from Plugins → Add New. Right after activation, there are options you should manage them. 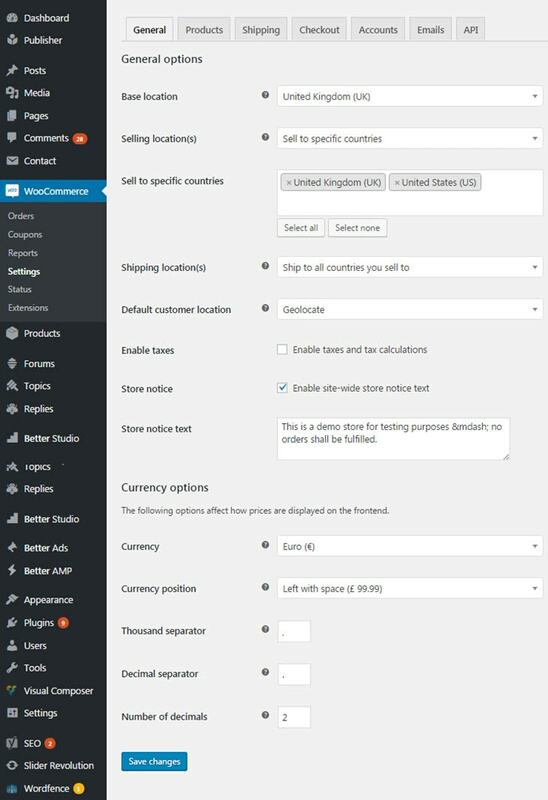 For this purpose go to WooCommerce → Settings, here you can find general options for shop. Base location: Select base location of shop; many states of different countries are available. Selling locations: Select countries you sell products to them. Shipping location: Select locations you have shipping service for. Default customer location: Assume a default location for customers. Geolocate is also available for automatically determining customer location. Enable taxes: Evaluate tax for every sale. Store notice: Write a note and display it in whole store. Currency Options: Choose how your price looks in your shop. These settings was essential. For more information visit WooCommerce documentation.